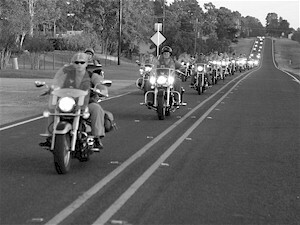 Current membership in National H.O.G. Desire to ride and have fun! Joining Cut N Shoot H.O.G. is easy. Print and fill out the Membership Application Form. Bring it, along with your current National H.O.G. card, to the next chapter meeting (see CNS Calendar). It's that simple! New membership enrollment must be done in person. We cannot accept new applications via mail, since we need to see your smiling face! The easiest (and preferred) way to renew your membership in CNS is to bring your current National H.O.G. membership card to the next chapter meeting (see CNS Calendar). Please include a self-addressed, stamped envelope for the return of your new membership card.